The Quality Excellence OnSite events allow you to see first-hand how our quality management solutions are put into practice by users and learn how the individual modules can assist you in your everyday processes. 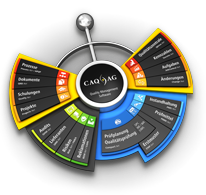 Apart from introducing the latest innovations and conveying the latest news from within the world of CAQ-software and quality management in general, these events primarily serve as a forum where you can discuss CAQ and quality-related topics with us and other users. We will be conducting this year’s Quality Excellence OnSite event in cooperation with our long-time customer Sektkellerei Henkell & Co. on the 29th of September in Wiesbaden, Germany. The Quality Excellence OnSite will begin with an evening programme on Thursday the 28th of September. Said program includes a guided tour of the champagne cellars at Henkell and a dinner at the Andechser restaurant in the heart of Wiesbaden. 6:00 pm Tour of Sektkellerei Henkell & Co.
Friday’s programme holds a lot in stock for everyone interested in cutting edge quality management solutions. The quality team of Henkell & Co. will be delivering presentations regarding the usage of CAQ.Net® in their company and CAQ AG will briefly introduce the latest functions and modules of their software. Following a tailor-made factory tour that focusses on the quality assurance systems in place at Henkell, the event will conclude with an open discussion round. 9:45 am What’s new at CAQ AG Factory Systems? The attendance fee for the Quality Excellence OnSite including overnight stay at the hotel is 380 EUR. Please note that we only have a limited contingency of hotel rooms available at this special rate and that they will be allocated on a first-come, first-served basis with regard to the point in time that we receive your registration. The attendance fee for the Quality Excellence Symposium without overnight stay at the hotel is 250 EUR. Participation in the programme on Thursday evening is already included in both options. Our Quality Excellence OnSite event will be held in German. About Sektkellerei Henkell & Co.
Not least due to Henkell & Co. group’s high standards that it sets itself and its products, the 2000 employee strong company was able to establish itself as one of the leading producers of champagne, wine, and spirits in Europe. Founded in Mainz in 1832, the now Wiesbaden-based winery stands for one of the most popular brands in the international champagne-market – Henkell Trocken. As producer of Germany’s most exported brand of champagne, Henkell & Co. has subsidiaries in 20 countries and exports its products to more than 100 countries around the globe. Henkell & Co group is the market leader for champagne, prosecco, wine as well as a variety of spirits in several countries. The company includes brands such as Fürst von Metternich, Mionetto Prosecco, Henkell, Söhnlein Brillant, and Wodka Gorbatschow. For more information, please consult www.henkell-gruppe.com. Impressions - Quality Excellence OnSite 2016 at Eagle Simrax B.V.